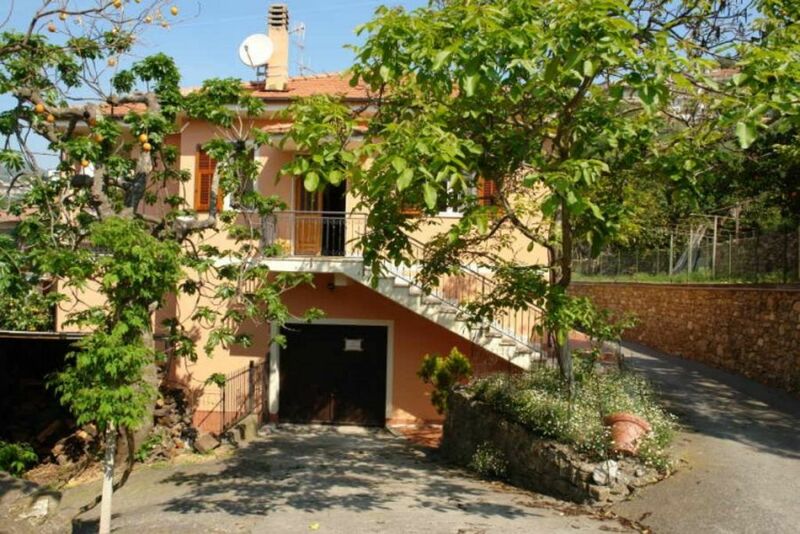 The house is completely detached and located at the edge of Moltedo. Every bedroom has been furnished with stunning olivewood floors. Casa Campagnola is certainly 'far from the madding crowd' and surprisingly large and spacious; the kitchen offers space enough for a group breakfast, even with many people. With its four bedrooms, there is sufficient space for everyone to find rest and relaxation after a gruelling day loitering about in the sun. The terrace and balcony offer great possibilities to escape even further from the mundane. There is a small Alimentari (convenience store) within walking distance, where you can treat yourself to fresh breakfast rolls. There is also a restaurant, La Campagnola, which offers Ligurian dishes specializing in meat and game. The holiday residence includes satellite TV as well as a washing machine. Alles hat gepasst. Einfache aber ausreichende Einrichtung. Man ist schnell am Meer, aber trotzdem ruhig gelegen. Restaurant "water wheel" ist direkt in der Nähe und zu empfehlen. Wir kommen gerne wieder! Strand von Andora - wuderbar. Im Großen und Ganzen waren wir zufrieden.Vor allem die kurzfristige Realisierung des Aufenthalts freute uns sehr. The furniture were good, I mean beds and fresh bathrooms and a large kitchen. great. The nice beaches and the cousy city, with a lot of nice restaurants. We are very happy with our stay. It lies approximately 5 minutes from the sea (with sandy beaches). There is a modern sports center and a supermarket located on the way to the beach, as well as convenience stores in town. It is situated in the lower end of town, with a view of the sea. It is surrounded by olive groves and a garden. The house is approximately 130 m above sea level. A private drive leads directly to our own parking lot. Distance to the sea: approximately 2 km as the crow flies. Golf: There are five golf courses in Liguria at you disposal. Here is a little summary of each and other info. The weekly rate is from 450,- EUR to 970,- EUR, actual seasonal rental rates available upon request. + deposit: 100 EUR Heating costs are charged by use.